So you want to sell your business, eh? Obviously, the reality is somewhere in the middle. Which end of the spectrum does it fall on? Hard data indicates that reality is much closer to the latter. 70% of businesses placed on the market NEVER sell. That’s 7 out of 10. If you’re a small business owner, I want you to think about your top 2 competitors. If you all went on the market today, statistically speaking, only one of you is going to sell. The other two would be liquidated. Yikes. Even if you are fortunate enough to receive an initial Letter of Intent, you are not “home-free”. According to Forbes, nearly 50% of all deals fall apart in the formal due diligence process! That means, in a TON of cases, the money and mutual interest is there, but it doesn’t get to the finish line because of something that happens in Due Diligence! I really like that definition. It’s simple and straightforward. Unfortunately, Due Diligence is anything but simple and straightforward. It’s a HIGHLY complex process that requires a TON of time, for both the buyer and the seller. The process of formal Due Diligence begins when a Letter of Intent is executed. This letter is generally non-binding, and usually discloses a range of possible purchase prices. Next, the buyer will likely sign a non-compete and non-disclosure agreement in exchange for the ability to review the seller’s sensitive documents. Then, all H*** breaks loose. These are just a handful of the topic areas typically covered. Have you ever seen an actual Due-Diligence Checklist? A short checklist is 10 pages long. An extensive checklist can push 25 pages without blinking an eye. What if you can’t find some of the information requested? …Or it takes you a few weeks to deliver the information because you’re ‘busy’? …Or you feel uncomfortable disclosing the information? As the selling party, that’s all your prerogative. I can promise you, though, it doesn’t paint you in a good light. Buyers generally are given 30 to 60 days, just to review the material once it has been received. At that point, all parties may come back to the negotiation table to try and close the deal. Start to finish, most deals take at least 6 months to close. Many can take significantly longer. Can you imagine the pain of having a deal fall apart in the final stages?! If the Due-Diligence process equates to actual wartime preparation (in terms of the planning and strategy required to do it well), most business owners act like they are preparing for a casual water gun fight in their backyard. Woefully unprepared. Wouldn’t it be nice if you could get a practice run at Due Diligence? You know, get bruised up a little bit – maybe a few years in advance of your exit. That way, you could figure out the things that you need to correct while you still have time on your side. Plus, you wouldn’t be blindsided by anything when Due Diligence happens for real, because you’ve got experience on your side. No surprises. By Exit Planning with Epiphany Law, you can do just that. Your first step is completing a State of Readiness assessment, which offers an unbiased opinion on the preparedness of YOUR COMPANY for a transition / sale. If you’re ready, great! Keep up the good work until it’s time to hit the ‘eject’ button. If you aren’t, we will recommend ‘next steps’ to get you where you need to be. Thanks for reading! To subscribe to our weekly content, you can enter your email on our homepage. Two separate business owners made a conscious decision to delay attending this kind of presentation until their exit is at arm’s length. As a person who is very educated on what Exit Planning is and how much work it takes, let’s just say those decisions scare the s*** out of me. Yes, I know, there is a certain contingent of business owners who simply cannot – and will not – mentally or emotionally handle the task of planning for their exit. In fact, we even wrote a blog about it: Exit Planning: Why Do Business Owners Avoid It? Bottom line: It’s just too much for them, so they stick their heads in the sand. Those responses we got – you know, a few weeks ago after the presentation – those felt different. To my mind, it feels like those business owners actually think it is OK to wait longer than they already have. Like, with the rational part of their brain. They weren’t being emotional, afraid, or willfully negligent. It seems like they were just living their reality. If that is the case, I have failed you all miserably. The truth is, executing an Exit Plan takes a hell of a lot longer than 6-12 months. If you wait until then to even start LEARNING about Exit Planning, you are way behind the 8 ball. You are asking for disaster. I’m not saying you are S.O.L, but I AM SAYING that you have effectively put the ball in someone else’s court and left value – i.e. MONEY – on the table. Okay… So how long DOES it take? First of all, did you know there are really only four (4) practical ways that you can transition a business internally? Intergenerational Transfer: The transfer of a business to direct heirs, usually children. About 50% of business owners want to exercise this option; only 30% do it successfully. Management Buyout: Owner sells all or part of the business to the company’s management team. Management uses the assets of the business to finance a significant portion of the purchase price. ESOP: Company uses borrowed funds to acquire shares from the owner and contributes the shares to a trust on behalf of the employees. Here’s the deal: If I’m going to be your Exit Planner, and you are considering an Internal Transition of any kind, I want our initial meeting to be at least 10 years prior to your exit. You heard me. 10 years. In all likelihood, you are not just GIVING this thing away. And you want cash at closing, not a promise to pay. In all likelihood, the person(s) you are selling it to can’t afford to buy it, and wouldn’t be able to secure financing. Give successor(s) $0.00, have a company worth $2,000,000. In 10 years, receive a 20 year note and a $150,000 first year payment. Give successor(s) $1,000,000.00, have a company worth $3,000,000. In 10 years, receive $2,000,000 and a 10 year note for the balance. If you come meet with me 5 years in advance, we cannot do that. If you come meet with me somewhere in between, the numbers might work. They might not. It’s anybody’s guess. If you’re planning to pursue a sale to a third party, I will be thrilled if you give me a 5 year runway to work with. If you give me 5 years, we can update everything: new hardwoods, appliances, siding, and roofing. We can check the plumbing and electrical. We can remodel the kitchen and master bedroom. Hell, we can even toss on an addition. And the best news: All of that will be done in 2-3 years, giving us the opportunity to truly pick our spot and capitalize on favorable market conditions when they are present. If you give me 3 years, we can still make a ton of updates. The house will truly be in great shape for buyers. Only problem: you aren’t giving yourself any time to play the market. Once the house is ready, you’re going up for sale, whether it’s a buyer’s market or a seller’s market. If you give me 1 year, we can update a handful of things and slap on a fresh coat of paint. That’s it. Smart buyers – yes most of them are smart – are going to try and poke holes to drive the price down. For most of you it’s going to mean the difference between a business that sells and one that sits on the market for 2 years before getting liquidated because nobody wants it. We track ROI for our clients. We’ve never had someone come out in the negative. We generally EXPECT our clients to earn at least 30% on their investments in Exit Planning by the time it’s all said and done. We generally kick off the process with a complimentary “exploratory” meeting. You’ll have the opportunity to ask questions and help us understand your true desires. Assuming all parties agree to move forward, we jump into “Benchmarking” your business. At that point, whether you hire us to gut the basement and paint the stairwell, contract it out to someone else, or ignore our advice is entirely your prerogative. After a very brief hiatus, Breakfast at Epiphany’s is back – and better than ever. Due – in part – to a recent uptick in demand for our services, yours truly got a sweet new title: Exit Planning Advisor. It’s a definite blessing, and certainly part of the vision I had for my future with the firm when I joined a little over a year ago. For the prospective client, very little changes. Kevin Eismann (Attorney/MBA/CEPA) is still the lead consultant. His unique blend of education, professional experience, and business acumen is the reason Epiphany Law is the premier source of Exit Planning in the Fox Valley. The new guy simply provides an extra set of eyes and ears to sit in on your conversations. I also bring an interesting new perspective to the table: As a ‘millennial’, I’m naturally inclined to process information through the eyes of a business owner’s potential buyers/successors. Compare that to most respected business consultants who – rightfully so – are well-seasoned, experienced, and trained to see the world exactly how business owners do. I’m inclined to see it with a twist. This allows me to chime in from time to time playing “devil’s advocate”. That perspective is particularly valuable to business owners selling or transitioning to a younger generation. I talk a lot about emotions in this blog. I don’t know. Maybe I’m an emotional guy. Thanks babe. Appreciate the love. She did go on to explain that with big decisions I tend to spend a lot of time analyzing and thinking things through, but when it comes down to it I will go with my gut. That made me feel marginally better. It’s interesting that she would bring up decision making, though. Today’s post is all about how one emotion – fear – plays a huge role in influencing strategy and decision making. Fear plays an interesting role in our society. Sometimes it manifests itself in response to a legitimate threat to our wellbeing. This emotion was extremely valuable in more primitive times – say, thousands of years ago when day by day survival was anything but a given. Fast forward to present day, and many of us are blessed to be able to navigate through an entire lifetime with less than a single handful of true life-threatening experiences. From a purely logical standpoint, one may try to assume that fear plays a lesser role in today’s society. After all, it’s original adaptation and purpose – survival – is no longer the prevailing purpose of our lives. In other words, the fear-center of our brain is still very-much alive. But it doesn’t just sit around patiently waiting for the once-in-a-blue-moon instance where it truly needs to be used. Instead, it continues to be used by our brains on the daily. In the absence of true threat, our brain has figured out how to conjure up illusions of threats to our existence. Dr. Karl Albrecht concludes that ALL of these illusions stem from one of 5 core fears common among humans. Extinction – The fear of literal death. Mutilation – The fear of damage to one’s body. Loss of Autonomy – The fear of immobilization, imprisonment, or other loss of control. Separation – The fear of rejection. Ego-death – The fear of public humiliation or self-disapproval. Without question, there is underlying fear (some real, some self-conjured) at play for business owners who consider Exit Planning as a resource. I want to expose those fears for what they truly are, and discuss whether they are illusions of the mind or justified concerns. 1) Fear of getting old. Through numerous conversations with business owners and years of research into the field of Exit Planning, it’s apparent to us that the departure from business ownership signifies “the end” of youth for many. The words “I sold my business” literally equate to “I’m old”. Ouch. But old age isn’t one of the 5 core fears common among humans. So what exactly is the underlying fear? At first blush, one may assume it to be death itself. People who fear old age are really fearing death, right? We have to be careful about making sweeping generalizations in this arena, as each individual is different. However, in our experience, it is actually more common that the classic “old age” fear is more closely associated with an Ego Death fear. In this case, being old equates to a dramatic loss of self-worth. Exit Planning = Old Age. Old Age = I’m worthless (Ego-Death). I fear Ego-Death; Therefore, I fear Exit Planning. One of my favorite quotes is from Abraham Lincoln, “It’s not the years in your life that count. It’s the life in your years.” Every day is a blessing, and making the most of it is simply a matter of choice. Those who choose to live with that perspective are able to find meaning in spite of a number. Bottom line: Aging is a state of mind. If you think you’re old, you are. If you think you’re young, you are. Retirement has nothing to do with it. 2) Fear of being bored. Make no mistake, simple “boredom” is relatively easy to cure for people who value themselves and have passion for life outside of work. We live in an era of limitless activities and hobbies for people of all walks of life. One simply has to open their eyes and give it the “ole college try”. In our experience, those worried about “boredom” are covering up a much deeper-seeded fear. Once again, it’s Ego Death. This time, self-deprecation stems from a feeling that their value as a human being is intrinsically attached to the title on their LinkedIn profile. If you look in the job description of most business owners, you will find the word “workaholic” as a prerequisite. Decades of painstakingly building a business hard-wires the need to be “productive” in one’s DNA. However, most will tell you that mowing the lawn and working around the house does provide the same level of satisfaction as spending a full day at the office. But why? Work is work, isn’t it? Many business owners describe their passion for the job as, “It’s all on me.” The level of responsibility is unmatched: Quite literally, the entire livelihoods of employees, families, and – in some cases – entire communities depend on you. Over the years, the relationship between business and business owner becomes almost symbiotic – that is, they need each other to carry on. Exit Planning = I am not a Business Owner. I am not a Business Owner = I’m no longer needed (Ego-Death). Business ownership creates an illusion of high self-esteem. It isn’t until the former is abruptly ripped away that the problem is exposed. For business owners who actually want to deal with the issue, there is truly no better resource than Exit Planning. The best Exit Planning consultants take emotional challenges of business departure very seriously, making it a staple in their process. That is, they dedicate several hours to the conversation – forcing clients to truly consider the impact that retirement will have. C-style personalities take enormous pride in their expertise and show tendencies to fear criticism – no matter how constructive it may come. D-style personalities take enormous pride in their independence and show tendencies to fear giving up control of any kind. Exit Planning = Hiring a Consultant. Hiring a Consultant = Giving up Control. Giving up Control = Ego-Death. Hiring a Consultant = Potential Criticism. If you avoid hiring someone because they bring nothing to the table – you are a wise. If you avoid hiring someone because they know more than you – you are a fool. Business owners should fear not what Exit Planning is, but the root cause of its existence as a practice. Consider for a moment the first time you heard of “Exit Planning”. With a great degree of confidence, I’d venture to guess that most have learned about it within the last 5 years. I’d be shocked if you knew about it prior to the Great Recession. Why is that? Why does it feel like this is such a new and growing idea? Did we just begin buying and selling closely held businesses in the past decade? Of course not. In a free economy, businesses transactions have taken place from the time the first one closed its doors. The real reason is that selling a business the way you want, at the time you want, and for the price you want is getting harder and harder with each passing day. To be fair, selling a business has never been “simple”. On a scale of complexity, it’s always been closer to “figuring out your wife’s mood” than “figuring out your dog’s mood”. These days, the scale has been flipped into overdrive. Vastly more complex, we are now talking about a scale that includes “figuring out your pregnant wife’s mood”. One needs only to have a rudimentary understanding of supply and demand economics to understand what I mean. Baby Boomers own 67% of private businesses in the United States. Let me repeat: two out of every three small businesses are owned by individuals aged 54 to 72. Two out of every three private businesses in this country are owned by someone that is VERY NEAR normal retirement age. That, my friends, has the makings of a mass exodus. What happens when the market becomes flooded with businesses trying to sell? Is that an attractive situation for business owners who need to net big money in order to retire? Nope. When supply abruptly exceeds demand – we call that a buyer’s market. The proportionately few individuals that are looking to scoop up small businesses will become extremely picky. Businesses who don’t make the cut will sell for pennies on the dollar – if they sell at all. Roughly 10 – 15 years ago, very smart people saw this trend coming. In response, they created a practice called Exit Planning – something to teach business owners how to prepare for the sale of their business. I guess it took a while for word to spread. I have news for you: the floodgates have begun to open. Brokerage firms are reporting that business sales are at all-time highs. The sliver of good news, for business owners selling soon: Your potential buyers have extremely easy access to capital. For the time being, demand for private businesses is keeping up with the supply on the market. That will not always be the case, particularly as interest rates continue to rise. The knee-jerk reaction of many business owners is to fear Exit Planning for what they associate it with: A threat to the Ego. By digging a little deeper, it’s easy to see that Exit Planning itself is in fact acting as the scapegoat for pre-existing character flaws that are likely to be exposed regardless. Businesses are becoming HARDER TO SELL. Business owners who don’t capitalize on a business sale lose control of their future. Now THAT is a legitimate fear. Want to take back control? PLAN. FOR. YOUR. EXIT. How long does Exit Planning take? Today, a new perspective: Making STACKS by participating in Exit Planning. That’s right. I said it. Stacks. Skrillas. Cheddar. Guacamole. Benjamins. Cabbage. Dough. Paper. Whatever you want to call it. We’re talking about the same thing here: MONEY. That beautiful, disgusting green parchment that people will die for and kill for. What if I told you that you could make money by spending 40 hours in the next year focusing on Exit Planning? The natural question is: How much? What if I said $400? Probably not worth it, right? Most business owners probably value their time a little more highly than that. What if I got crazy on you and said $80,000? $2,000 / hour. What if I said you could easily exceed that? Fair. If I was in your shoes, I probably wouldn’t believe it either. There are too many frauds out there these days looking to make a quick buck. But before you close the page, please hear me out. This isn’t some magic pill that instantly helps “cut the fat” from your business. No, what I’m talking about is much more “pushups and situps” than it is “scientific breakthrough”. It requires sound business strategy, commitment, and a long-term focus. If a business is completely dependent upon the business owner, that business will likely be valued based upon an adjusted book value of the assets on its balance sheet. 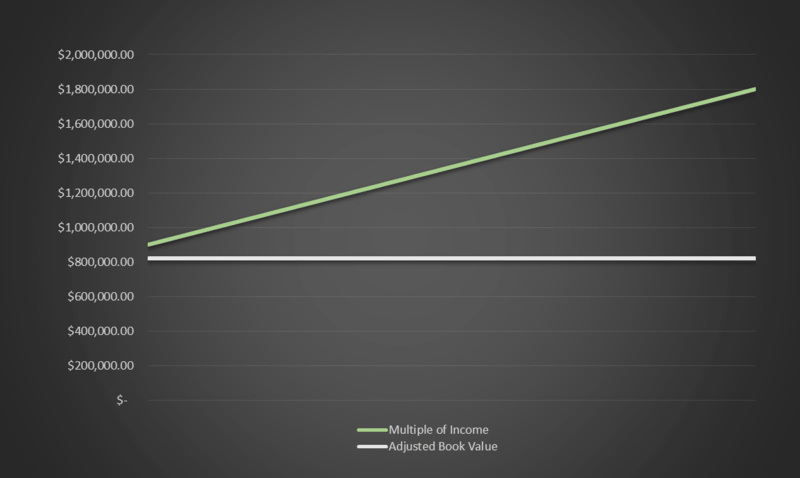 Adjusted book value also applies if there are major risk factors that prevent the transfer of customers, revenue and ultimately the income stream to a new buyer. It doesn’t take a rocket scientist to understand that small business owners want to be on the green line. It takes a business that would be on the white line, and – using sound business strategy – helps reorganize the business so a future buyer will see them as a “safer” investment. In this case, simply moving from the white line to the lowest possible value on the green line means an increase of $80,000 in value. The next step in the Exit Planning process is taking a business that is situated on the green line and making calculated steps to move them up. The average small business has a myriad of risk factors that – when seen by a potential investor – serve to constrain the value toward the bottom of the green line. A good Exit Planner knows what those risks are and tells you to correct them so you can increase your value. A great Exit Planner gives you tools, advice, and essentially becomes an active stakeholder in your business to help you get the job done. Identifying when you have a risk and telling you to correct it is easy. Our process is literally built for that. We also have tools and expertise to share that can help make change happen. Exit Planning is THE way to maximize value as a business owner approaches retirement. Obviously true potential depends on the facts involved, but you know that old adage “the sky is the limit”? Yeah, it applies here. Cynical minds will say I “made up” numbers to serve my own agenda. My response: Yes. You are correct. Those are fictional numbers. I did not think it a prudent idea to throw balance sheet and income figures from our actual clientele up on a public blog. However, I needed numbers to help you visualize and solidify the concept. In the end, this isn’t a submission to the Harvard Business Review. It’s a casual blog dedicated to teaching complex subjects in a way that people can easily understand. We accomplished that purpose today. Last thing: what I did here – particularly as it relates to the art and science of business valuation – is EXTREMELY rudimentary in nature. Individuals who want to learn more should seek expert counsel. The business model of a private equity firm is easy enough to understand. Right? Here’s how it all begins: A group of individuals (collectively, the PE firm) raise money by presenting an investment strategy to other companies (financial institutions, for example) and wealthy individuals. Once money is raised, the investment period closes. The PE firm takes the money they raised and – following the core investment strategy – buys businesses. Once a business has been purchased, the firm uses their expertise to manage the business for a period of time (5-ish years) before selling it (either back to the management team or to an entirely new party). If they’ve done their job successfully, the value of the business has grown, and they have a net profit to take home to their own investors. *PE Firms usually want to buy a majority stake (over 50%) in the businesses they acquire. Why? Simple: They want to call all shots. XYZ Equity conducts multiple presentations of this core investment strategy in front of potential investors. Thanks to the soundness of their strategy and the experience of their consultants, they raise $10 million in the initial round. XYZ Equity goes shopping for companies that meet their criteria. XYZ Equity buys a 100% stake in AB Drilling, Inc., a niche manufacturer of Deep Sea Drilling Equipment in central Indiana, for $3.5 million. It’s an ideal acquisition for XYZ Equity, because one of their senior consultants previously owned a profitable heavy-equipment manufacturing company, and two more of their consultants have extensive engineering backgrounds. Over the course of 2 years, XYZ Equity invests another $1.1 million to grow the company, and successfully flips it to a competitor for $7.6 million. A $3 million gross profit! So that’s all fine and dandy, but the real question is… How do you – the small business owner – take advantage of Private Equity as a resource to sell your company? All of these PE firms are looking for something a little different. Will Accept Minority (<50%) Ownership Stake? *Keep in mind that these are general guidelines. In many cases, PE firms have the ability to remain flexible with their investment criteria. It is recommended that business owners contact a PE firm directly to discuss any potential investment opportunity. Epiphany Law’s Exit Planning Program is designed to prepare a business for sale. It is designed, specifically, to help a business become more attractive in the eyes of a 3rd party buyer – like a Private Equity firm! It addresses each of those ^ criteria, and many more. One of my life’s obsessions is empathy. For those who don’t know what that is, empathy is the ability to understand and share in the feelings of another. Put another way: It is the ability to put yourself in someone else’s shoes. To understand what they think, how they feel – and beyond that – why they feel the way that they do. Empathizing with someone is one of the kindest, purest things you can do for another human being. It takes TIME to empathize. It expresses true care. Beyond that, the practice of empathy helps YOU succeed in life. By empathizing, you instantly become a better communicator. 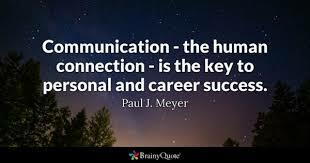 The best communicators are selfless. They take the time to gather more information. They figure out how the other person feels. Then they adapt their own actions/behavior/advice accordingly. Communication is a huge key to the successful transition of a family business. As the current owner of the family business, you are in a great position to extend empathy to any children who are next in line. Don’t expect them to be you. It happens ALL THE TIME. There is a named successor. Maybe it’s the owner’s daughter. She has a solid role within the family business. Business owner: “I don’t know if this is going to work out. She just doesn’t have the sales skills to drive new business and that is an important part of what I do.” Stop it. Focus on her strengths instead of her one glaring weakness. Figure out if there is a way that you can restructure the business so that sales no longer fall on the owner’s shoulders… i.e. hire a sales team! Address concerns directly. If there ARE unavoidable concerns with your successor, address them directly. Don’t make backhanded comments hoping to send the message. Don’t embarrass them in front of other employees. And most of all, don’t sit on your concerns “hoping” that something will magically change. If you do, you are setting everyone up for failure. Don’t forget about non-family employees. Whether you made specific promises to key employees or not, don’t forget about them as you begin making a transition. Allow them to express any concerns, and let them be a part of the solution to those concerns. This will help them feel valued and “in control” as the transition begins to take place. Also, there are many ways to reward key people for their years of loyalty without giving them cash or a stake in the family business. Don’t get greedy. We see this one a lot too. A business owner will have an outstanding successor lined up, the transition of duties will go extremely smoothly and all-of=-a-sudden the business will experience a growth period. Of course, no formal agreements were made so the owner decides to hand on and reap the rewards a little (or a lot) longer. Make formal agreements and stick to the terms of those agreements, otherwise conflict is inevitable. Show them how to buy-in. It is entirely possible (likely, in fact) that you cannot afford to “give” the company to your successor. Don’t let this deter you from keeping the business within the family. If time is on your side, there are ways of helping your successor build enough capital to buy you out. Multiple children. The absolute worst thing you can do is ignore the conversation and keep the future of your estate a mystery to your children. In the face of mystery, most people begin to act very irrationally. Starving for clarity on the situation, they will formulate their own (false) set of facts to try and control the narrative. Depending on their outlook on life, those facts will be heavily slanted for or against them, and fracture within the family will ensue. This can all be avoided if you – the leader of the family – are willing to step up and provide a clear and well-reasoned agenda for how the business will be distributed. You should do it the moment you sense it becoming a concern among your children. As always, give us a call or shoot me an email if you have more specific questions! What does Tax Reform mean for Departing Business Owners? Do you remember that sinking pit in your stomach you got after you received an exam back from the teacher and it was a bad score? That feeling has got to be one of the worst things ever. I’ve always been my own worst critic, so it killed me inside when I didn’t live up to the standards I set for myself. Thankfully, my mom always knew what to say to get me back on track. Simple, but great advice. It helped me refocus my perspective and move forward with new energy. Talk to the teacher, do extra credit, and above all else: Bust my a** to make sure it didn’t happen again. The bill was passed and signed. Barring something unprecedented, it will be effective for at least the next 4 years. If you’re a small business owner nearing the end of your runway, in some respects this bill should feel more like “100% A+” territory than anything else. BizEquity recently published a white paper predicting trends for 2018 valuations of privately-held businesses. The spark-notes version of their findings is that valuations are expected to trend upwards, across the board, in 2018 due to positive GDP growth and tax cuts. The overall methodology is pretty simple: The economy is doing well, so in general, businesses should make a little more money than last year. Those businesses also don’t have to pay quite as much in taxes as they did last year. These two elements result in more money on the table for the owner(s) of the business at year-end. Increasing the “bottom line” is one way to increase the value of your business. The bottom line of every business in the nation was just increased, by virtue of the 2018 tax bill. According to wbjournal.com, more than 90% of business sales to an outside 3rd party (where the purchase price is < $10 million) are Asset-Based sales. 99% of the time, an asset-based sale requires the seller to pay ordinary income tax on some portion of the gain from sale. Sometimes, like in businesses that have a large amount of fixed assets, accounts receivable, or work-in-progress, the amount taxed as ordinary income is quite large. Thanks to the new tax bill, the highest marginal rate fell from 39.7% to 37.0%. 2.7%, for many business owners, can mean tens – if not hundreds – of thousands of dollars in tax savings – if you sell your business in an asset-based sale under the current regime. I would get into an example, but again, it’s highly complex and I don’t want to distract from the point (look for a future post on asset vs stock sale). What will tax rates do in the future? Look, I’m not here to speculate. I’m here to bring you facts. Period. Some people like to look at the past to predict the future. If that’s you, you’ll enjoy the following chart. The blue line represents the United States’ highest marginal tax rate for each year since 1913. The orange line shows the current highest marginal tax rate. Based on that chart, in the last 100 years (since 1918), there have only been 22 years of MORE FAVORABLE tax environments to departing business owners. Other people like to look at the Nation’s current Debt situation as an indication of where taxes might head in the future. If that’s you, you’ll enjoy the following chart. The blue line is the same. The grey line represents Debt / GDP (an indication of our country’s ability to repay debt) for each year since 1913. I don’t know what the tax situation will look like the next time someone rolls out a new tax bill. I’ll say it again: CONTROL WHAT YOU CAN CONTROL. If you are a business owner who is approaching retirement, you were just given an A+ grade. Now you control the situation for at least the next 4 years. It’s time to strike while the iron is hot. Use your time to develop an Exit Plan. Control your risks. Maximize the value of your business. And get out on favorable terms. None of us know what the future holds, so there’s no sense wasting any more time worrying about it. The time to start your Exit Plan is NOW. Contact Epiphany Law to do so.